A team of archivists has begun sorting through 60 years of Department of Health (DOH) records thanks to a grant from the National Endowment for the Humanities. During the next year, they will process 800 Bankers Boxes of historical records from 21 NYC Health Department Commissioners, ranging from Shirley W. Wynne in 1929 to Woodrow Myers in 1991. The final result will be a detailed guide to the collection. The records document New York City’s long-recognized leadership role in disease prevention, vaccinations, health education, food safety, drug and alcohol addiction treatment, family planning, and health care for infants, school children, and expectant mothers. The records also show how city government reacted to, and managed, acute outbreaks of infectious illnesses such as diphtheria, measles, polio, typhoid fever, and HIV and AIDS. For example, the DOH implemented and upheld strict regulations on the production of milk to control typhoid fever outbreaks. 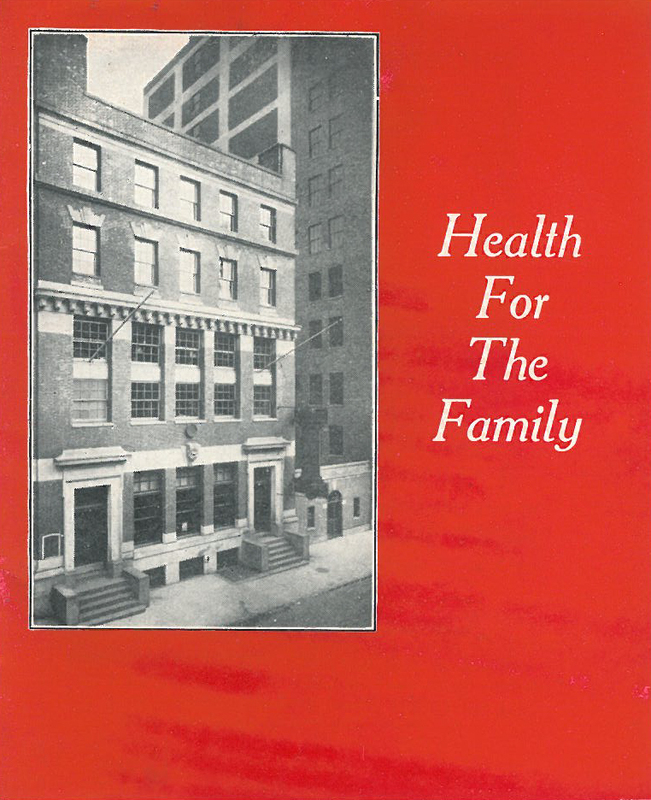 This 1929 pamphlet for a privately- funded, city-operated clinic advertises a variety of free services from prenatal care to nutrition and dental exams. Milk and food inspection feature prominently in early parts of the collection. This card from 1933 shows the results of testing on the effects of an aluminum cottage cheese cap on the food, with the cap attached. Most of the records consist of correspondence to and from the commissioner and top officials in the DOH. There is also correspondence from ordinary New Yorkers who wrote to request publications, ask health questions, or register complaints about conditions in their neighborhoods. They also asked for expert advice on gimmicks advertised on radio and in various publications. The correspondence shows how the DOH combated misinformation deemed “medical quackery.” The papers also contain a wealth of information about policy and legislation, as well as the inner-workings of the Department. The collection also includes fliers, newspaper clippings, pamphlets, photographs, posters, and other materials created by the Department for public outreach campaigns. This 1932 Department of Health pamphlet emphasizes the connection between dental health and overall well-being and includes diet and brushing recommendations for parents. Community health care is another important theme highlighted in the collection. 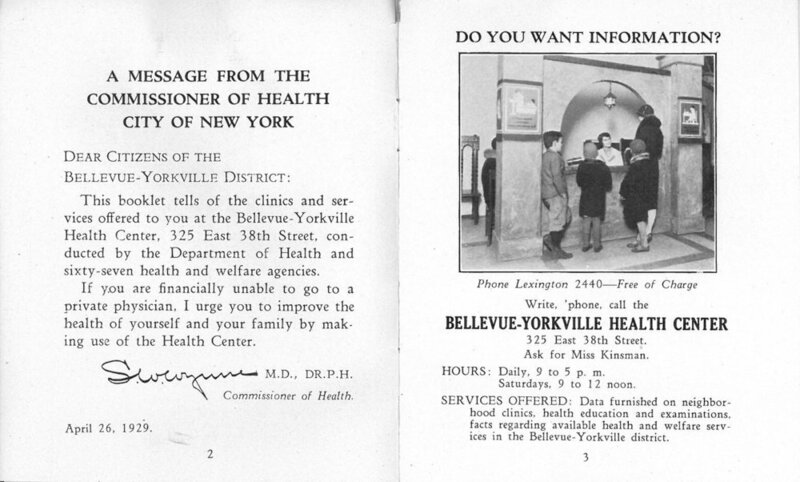 In the 1930s the city was divided into 30 health districts, with the goal of establishing city-operated clinics tailored to the neighborhood. The first clinics opened in the 1930s and provided an array of public health services, with a focus on children and expectant mothers. In particular, the DOH played an active role in training midwives to reduce infant mortality. A puppet show produced by the New York City Department of Health showing precautions to be taken to avoid spreading disease while children are at play. A newsletter produced by the Department of Health. Each newsletter focused on a specific health issue, in this case, pneumonia. The collection is particularly strong in documenting DOH efforts to combat infectious diseases. Although the commissioners faced differing outbreaks and epidemics over time, there is a common thread in their responses: vaccination, educating the public, and establishing local health centers to get information and treatment to the community. These strategies are still deployed to this day. New York City set a public health example for the rest of the United States and continues to do so. Overall, the materials exemplify New York City’s commitment to its citizens and their health. We have only begun to realize the collection’s worth and potential. Watch for more posts about the Health Commissioners’ records as the work continues. We look forward to sharing highlights from the collection and the insights that they provide! A pamphlet devised by Shirley Wynne (Health Commissioner 1929-1934) describing healthy ways to lose weight. The pamphlet includes weight loss strategies and statistics, as well as average caloric counts for common foods. This project has been made possible in part by a major grant from the National Endowment for the Humanities: Exploring the human endeavor. Any views, findings, conclusions, or recommendations expressed in this blog post do not necessarily represent those of the National Endowment for the Humanities.